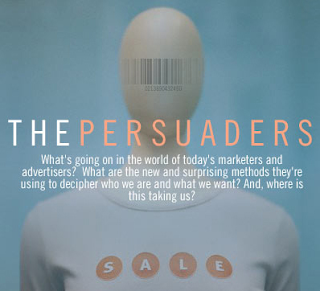 Years ago I picked up a DVD of BPS documentary called "The Persuaders" at the Boarders bookstore. Well, since then the store went under and the proliferation of the Internet and online services made access to content much easier, and in some cases completely free (unless one chooses to pay for the DVD quality video and an ability to watch it offline). Does one have anything to do with the other? Probably, but it's not what this post is about. It's about the documentary. I found it incredibly interesting and in some ways eye opening. Check it out, see how far the persuasion industry takes its advertising mission (and keep in mind that by now it is probably significantly farther than at the time of the documentary's release in 2004); how it view us, the consumers (roaches being sprayed with ads until developing resistance); how it blends advertising and reality (to the point when one can't tell them apart); etc. In short, enter The Persuaders (click on the image below to view online).